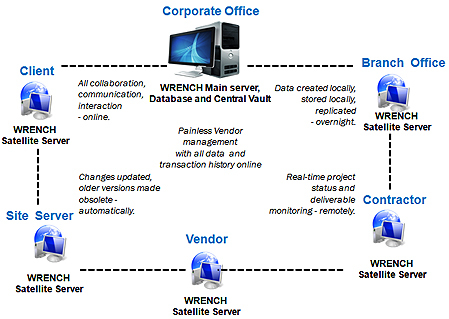 WRENCH – the world’s ONLY end-to-end enterprise software for the Engineering and Construction industry. WRENCH | enterprise™ is a software solution built for the Engineering, Procurement & Construction industry for efficiently managing turnkey projects. The software integrates Project Management, Quality Management and Engineering Data Management. It has built-in industries best practices acquired over a period of one decade working with leading Engineering companies. The system provides facility to manage and track all engineering deliverable including engineering drawings, worksheets, specification etc. Broadly speaking, WRENCH | enterprise™ enables to execute projects efficiently by monitoring the deliverable of a project and giving users easy accessibility to all project-related deliverable and all related documentation. It brings in complete accountability for task by providing a To-Do-List to the resources of a project. Tasks can be routed through predefined workflows process as specified by the organisations quality management system. Progress of each deliverable can be consistently monitored in a collaborative environment. With WRENCH | enterprise™, you can create, manage, store and easily retrieve all project-related documents from anywhere in the world, at anytime. In addition, it duly enforces the change management processes and permits access only to the latest information to the end-user. Older versions of all Engineering data are stored with the history information too. Engineering data/documents of past projects can also be stored and this can be reused for future projects. The system meticulously enforces regulatory compliance in the organization’s procedures, controls the access to the data stored and eliminates the delay and error caused by human resources.